14 March 2019, Dera Harisar, Kila Raipur: Well, ‘Chet’ is here; to remind us of the onset of a beautiful month when it’s neither too hot nor to cold. 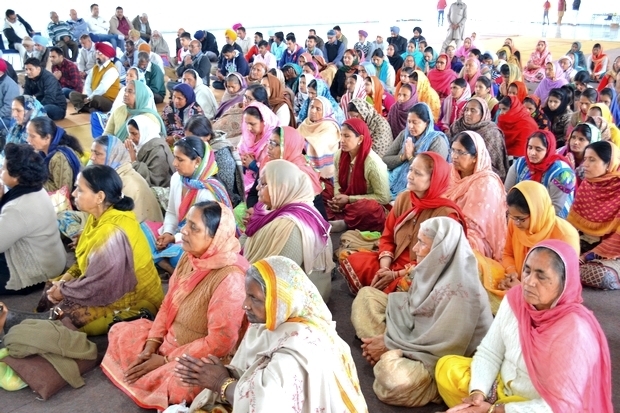 Guru ji in Barah Maha Path suggests that those who pray to Him for Him in this soothing month are to be blessed with Amrit, the divine nectar. For a sincere seeker, a question follows – How to pray? 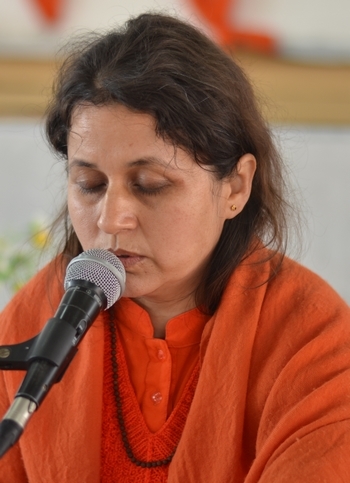 Let’s find it out through the divine discourse by Sadhvi Yoganjali Chaitanya Puri Ji! It is in the company of saints that one gets the key to the road to the divine nectar. Saint Tulsidass states that saints are like clouds filled with divine nectar. If Rama, Himsef is a cool-breeze bringer sandalwood then saints are that air that help that cool-breeze reach us. So far, we have failed to receive that cool-breeze in spite of the ever-flowing air around us because we are infected with maya, the illusions and therefore are ever-running from one place to another for one thing or another. It is often heard that– I am getting bored. We are so much dependent on another human or resources for that matter that we cannot enjoy our very own company. Here the sutra for eternal bliss in long run is to get ‘chet’, to get reminded of the truth that I am not this body. Entirety lies within me. Enough time has been spent in eating-drinking, or sleeping. Let’s develop a taste, a liking, a craving for participation in Satsangas, to meet other aspirants of this divine journey, the Satsangees, and to do Sadhana. It’ time to Act While We Still Have Time.